Albuquerque maid services offer a wide variety of solutions for your housekeeping needs. Aside from home organization, the experts possess know-how in removing ugly stains from your furniture and fixtures. Here are some of their stain-removal hacks. Vinegar is a powerful cleaning agent. You may dip a sponge (preferably a genie variant), squeeze some of the moisture out and proceed to wipe off the greasy smudges on your wall with little effort required. Subsequently, use a wet cloth to rinse the vinegar from the wall surface. You may consider using the thermal properties of vapor to your advantage. This method is effective against oil-based stains. First, switch on your home iron and leave it at minimum heat for a few minutes. Then, find some cloth or towel and hold it against the stained area. By running the iron against the towel held in place, heat will slowly dissolve the oil molecules, allowing you to wipe off the stains with little effort by using a damp cloth — finally, clean remnant stains with a dry towel or sponge. Most metals corrode due to exposure over time. To remove those pesky stains from thin metals caused by corrosion, consider using baking soda. Coat damaged portions with the powder and leave it for an hour or so, then proceed to scrub off the rust using a rough surface such as steel wool. For more stubborn stains found on kitchen knives, opt for a lemon juice treatment with a dose of salt. Just dip the affected areas into a mixture of lemon and salt before letting it sit for an hour. Then try to scrub the rust off with the rind of the lemon. If this fails to remove most of the rust the first time, let your objects sit in the mixture for an additional hour and repeat the scrubbing process. This Depends on the type of stain. For wine, apply a spoonful of salt over the area and let it soak up the dye, which could take a few hours. Vacuum the excess salt once the wine stain is removed. 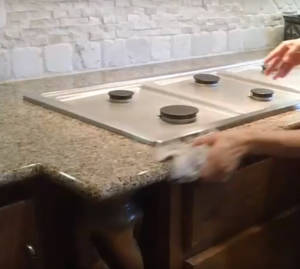 Dampen the area with cold water and vacuum again to remove leftover stains. For coffee stains, dab the area with a dry paper towel, dampen the area with lukewarm water then dab again to remove the rest of the stain.